The Federal High Court sitting in Abuja has dismissed an application filed by the former National Publicity Secretary, People Democratic Party, Mr Olisa Metuh, asking for the release of his International Passport to enable him travel abroad for medical treatments for a spinal cord aliment. The trial judge, Justice Okon Abang, while dismissing the application, held that he was concerned that Mr Metuh would abscond and not be available to conclude his trial if he was allowed to travel abroad. Justice Abang further held that Mr Metuh cannot pretend not to be aware of the existing order of the court on his International Passport. 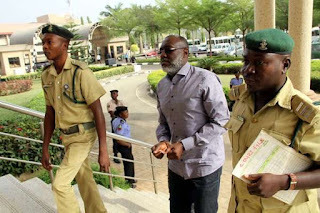 According to him, Metuh’s application amounted to asking to reverse its earlier order that allowed him to be on bail, since his passport form one of his bail conditions. He added that a bail condition could only be varied when an accused person has not been able to set the conditions. He noted that while he was not in a position to question the opinion of the doctor at the National Hospital, Abuja, there was no reasonable evidence from Metuh to prove that no Nigerian hospital was capable of treating him of the spinal cord related illness. Justice Abang consequently dismissed Metuh’s application for lack of merit and on the ground that the court lacked the jurisdiction to entertain the application since there was a subsisting order of the court asking him to deposit such documents with the Court Registrar. Metuh had on May 16, applied to the court through his Counsel, Emeka Etiaba (SAN), asking it to return his travel document to enable him travel abroad for five weeks to access medication for a spinal cord related illness.